lucky. 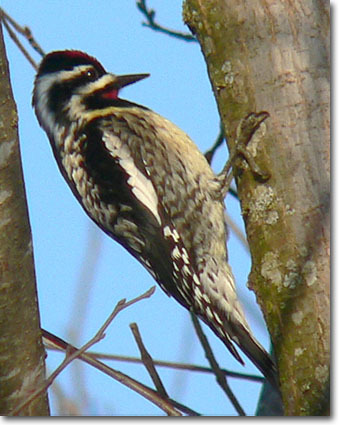 Although “yellow-bellied sapsucker” is sometimes tossed around as a joke among non-birders, the species is quite real and very interesting. 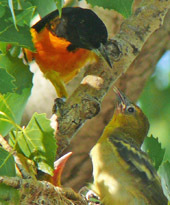 It derives the “sapsucker” name from its habit of drilling small holes into the bark of living trees, and then returning later to drink the sap that flows from these holes; and it does have a yellowish belly although often this cannot be seen too well—among tree shadows and limbs—as the bird clings to a tree. Bent (Life Histories of North American Woodpeckers, 1964 reprint edition) related that McAtee, in a 1911 publication, stated that “…the yellow-bellied sapsucker attacks no fewer than 246 species of native trees and 6 vines, besides 31 kinds of introduced trees. Twenty-nine of these trees and 1 vine are known to be sometimes killed and 28 others are much disfigured or seriously reduce in vitality.” Because we have a reasonably low population of this woodpecker during migration and winter, timber in our area does not seem to be too adversely affected. Besides sap, sapsuckers supplement their diet with insects such as ants, beetles and wasps, some of which get caught in the flowing sap at tapholes. They also supplement their diet with nuts and berries. Bent (1964), also related information from Bolles, taken from an 1892 publication, who raised 3 young sapsuckers in captivity: “They subsisted almost entirely on maple syrup and water in equal parts, fed by hand at first, but in a few days they drank readily from a basin.” Each consumed about 8 teaspoonfuls of syrup per day. Unfortunately, these 3 young, captured July 7, lived only a little over 3 months in captivity before they died, so there apparently were some diet problems in holding the birds so long in captivity; the autopsied birds showed abnormalities in the liver. The Yellow-bellied Sapsucker migrates through Oklahoma and some of them remain in the state for the winter. On Christmas Bird Counts, from 1940 to 2009 the number of sapsuckers seen per party hour for the entire U.S has risen from about 0.025 birds/party hr. to about 0.075 birds/party hr; numbers for Oklahoma, from 1952-2009, average about 0.125 sapsuckers/party hr. 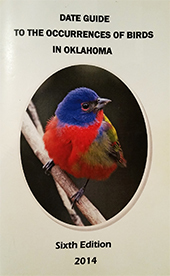 ; and numbers from 1952-2009 on the Oklahoma City CBC average about 0.04 birds/party hour, or about 1 sapsucker for every 25 party hours of field time (this is a good illustration of why knowing approximate party hours are important data on CBCs) (above data from Audubon Society CBC results). Years ago, Hubert Harris, a club member, banded a Yellow-bellied Sapsucker in Oklahoma City and it showed up several days later (5 I think) in Redwing, Minnesota, a distance of some 550 air miles. Bird band returns from areas other than at and near the banding site are very rare, so the sapsucker Hubert banded told an interesting story of a bird moving hundreds of miles north-northeast in the span of a few days.